Independent heating, tv, dvd & cd player, AC, microwave, WiFi. center of Rome in an area ideal for visitors. All major tourist attractions are at a walking distance. In this area you will also find the best shopping and dining in town and a thriving night life. ceilings, parquet floors and is fully equipped with kitchen, air condition, heating, wi-fi connection and a washing machine.Towels and linen are provided. Minimum stay 3 nights. Don't be fooled by the outdoor patio! You need to crawl thru a closet to get to it, It was very disppointing. I was hoping to be able to sit outside with my morning coffee but I couldn't. Also, be aware of the 92 steps to the apartment. A beautiful very well located apartment in Rome - friendly greeting upon arrival, very helpful-kindly carried suitcase to apartment (86 stairs). Very clean spacious apartment with useful info re local resaurants. Only problem .....had to leave!!!! Great place to stay. Perfect location. Quiet. Friendly landlord who speaks great English. Would definitely stay here again. Appartement lach in het oude centrum van Rome op 5 minuten lopen van piazza navona en 5 minuten lopen van de engelenburcht. Alle grote bezienswaardigheden zijn lopend te doen en bevinden zich in een straal van 1,5 kilometer van het appartement. Het appartement bevind zich op de vierde verdieping en heeft alles wat je nodig hebt voor een verblijf in Rome, twee slaapkamers badkamer keuken woonkamer en wasmachine ook is er draadloos internet beschikbaar. Voor mensen die minder goed te been zijn raad ik het af in verband met de trappen die genomen moeten worden naar vier hoog. 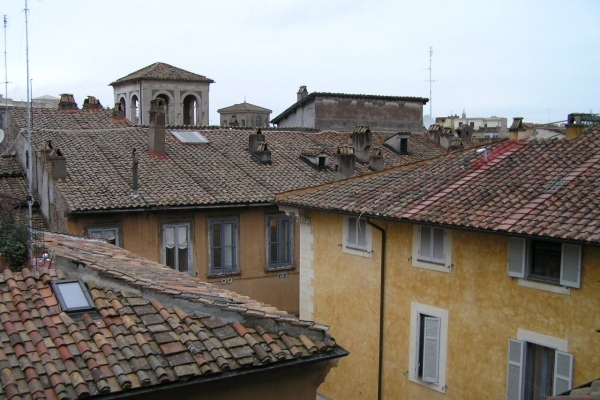 Verder hebben wij er een enorm genoten van het appartement en de mooie ligging in het oude Rome. De eigenaar is vriendelijk en behulpzaam heefft in het appartement diversen informatie folders liggen van betaalbare restaurants musea, in de omgeving. Highly recommend this apartment. The owner was great to work with - was waiting for us when we arrived, even after we were delayed by several hours having missed a connecting flight. Gave us a tour of the apartment and instructions to appliances. Answered all questions. Even had a folder full of useful information for visitors. At the end of our trip he arranged for a driver to pick us up at 5am! He was always very accessible prior to and during our trip. The apartment was spacious and clean and we couldn't have asked for a more perfect location. The WiFi worked flawlessly. Safe and convenient - we walked to every site in Rome. Situated on a lovely street, with shops, restaurants, markets, and a superb coffee bar nearby. Don't let the stairs stop you from renting this wonderful apartment on a charming street - it is well worth it and the work-out is great! Appartement très agréable, propre, lumineux , silencieux, au coeur du coeur de Rome. Nous y retournerons les yeux fermés. Great apartment. Wonderful position in Rome. Very comfortable and really helpful owner. In fact the only thing I missed from home was wifi and the next day the owner even had that installed. What more could I ask for! Quite a few stairs to apartment. No problem for us, but worth considering when booking. But, as I say, it wasn't a problem, as when you reached the apartment it was worth the climb! Highly recommended!. TrÃ¨s bon emplacement, appartement agrÃ©able et tranquille, belle vue sur quelques toits, terrasses et clochers romains. La montÃ©e des escaliers vous assure un exercice quotidien indispensable pour Ã©liminer les calories prises dans tous les bons restaurants environnants Ustensiles de cuisine un peu limitÃ©s et literie Ã l'Ã©tage moyenne.Je conseillerai cet appartement pour profiter de Rome dans sa splendeur et son animation.